CoinFest UK continues to grow and attract the most of CoinFest’s international attention. This year was no exception, with a new record of over 700 free tickets claimed for what turned out to be a very energetic gathering at the Manchester Conference Centre. The three-day event was once again led by Adam Rizvi of CryptoBatesGroup. In addition to workshops and presentations, they had an art gallery and two noted musicians, the Bitcoin Rat guitarist and hip hop star CryptoRaptor. Other highlights included the raffle, a “cash” grab machine, crypto-themed photo booth, and swag such as Bitcoin forks (utensils). CoinFest Vancouver made a bit of a resurgence this year. In addition to serving as the operational headquarters of the decentralized activities, there were three full days of activities organized in coordination by multiple organizations. Highlights included the party bus to take people around and the Bitcoin food truck waiting for them at each location. The first day consisted of merchant-hopping around Bitcoin-accepting event venues, including historical locations such as the world’s first Indian restaurant to accept Bitcoin and the location of the world’s first Bitcoin ATM. 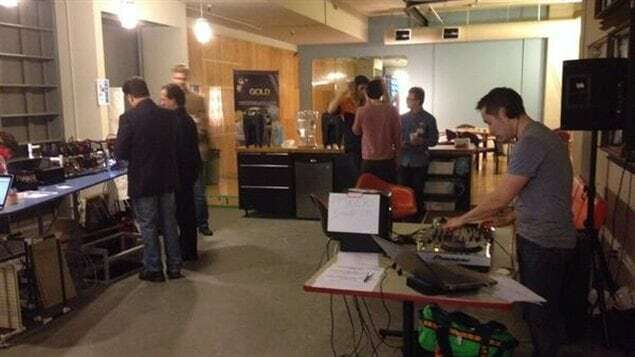 Mini-conventions were held at the offices of CoinPayments and RightMesh, with DCTRL serving as the afterparty venue each night. Free beer from a Bitcoin brewery was had by all! The traditions of CoinFest in the Netherlands continued mostly as usual. CoinFest Global put forth grant funding to help open Bitcoin Wednesday up for free casual attendance at the bar and dining area of the conference. VIP tickets were still required for seats for the presentations and to board the Crypto Canal Cruise. Arnhem is a city in the Netherlands where Bitcoin adoption runs strong. Their Bitcoin City website has a map showing off the dozens of places around town where tourists can sleep, eat and drink with Bitcoin. The locals gathered to do lots of the latter in celebration of CoinFest and in patronage to their supporting merchants. Long-time CoinFest volunteer Tim Tayshun brought the festivities to California once again. Previously, he had been occupied by a bogus slander lawsuit issued against him by noted scam operation OneCoin, the legal fees for which were paid partially by CoinFest. In addition to many giveaways, including over $1000 in cryptocurrency on the Wheel of Bitcoin, CoinFest Irvine boasted free food and entertainment, a Bitcoin ATM demo, and investor-developer speed dating for hyper-fast blockchain networking. Sub-Saharan Africa was, always has been, and probably always will be one of the regions where CoinFest is most celebrated. Grant funding was bestowed upon three separate countries in order to foster entrepreneurship through cryptocurrency. This included the capital of Sierra Leone, an impoverished region which is still recovering from the effects of civil war and the Ebola virus. Other celebrants included Botswana and Nigeria. Botswana was organized by the Botswana Bitcoin Lady and held at Satoshi Centre, her community incubator for blockchain startups. CoinFest Nigeria is returning for the second year thanks to Babarinde Kayode, who managed to fly speakers into Abuja from outside the continent. As usual, the International Hangout was the most prominent decentralized activity during CoinFest 2018. The host was located in Vancouver, the effective headquarters, with livestreams set up in Manchester and Arnhem and viewers all over the world. Discussion topics included Blockchain Gaming, artificial intelligence, user security, and exchanging. The Lightning Network was another major topic of discussion. Bitcoin Co-op founder Adam Soltys retrofitted his CoinOS app to handle Lightning payments, which were successfully made at multiple participating merchants during CoinFest. Eight merchants experimented with the new technology in total. Manchester stole Vancouver’s throne in 2016 as CoinFest UK went on to become the largest local gathering. CoinFest UK was even bigger in 2017, with Adam Rizvi of Crypto Bates Group reigning as organizer. Festivities lasted for two days at the Manchester Conference Centre, which made a special arrangement for CoinFest. There was another raffle, tons of speakers and demonstrations, and an even wider variety of workshops. The Netherlands is no slouch when it comes to Bitcoin adoption, and their appetite for CoinFest proves it! Every year we partner with Bitcoin Wednesday in Amsterdam, and this year’s event proved to be the biggest in their history! Bitcoinference participated again, as well, this time in a Bitcoin-friendly coffee shop. To the southeast, meanwhile, lies Arnhem, the world’s most Bitcoin-friendly city. They gathered for CoinFest at a beer garden, the city’s newest convert to Bitcoin acceptance. CoinFest’s free attendance model has always been appealing in Africa, but 2017 was particularly remarkable. Nigeria, Africa’s largest economy, participated for the first time, as did Sierra Leone after years of delay due to the Ebola virus. Also, CoinFest Botswana made a return following the establishment of Satoshi Centre in Gaborone. Another incumbent was CoinFest Ghana, which—after 3 years—reached a record of over 150 attendees! A handful of events also occurred across North and South America. Fort Galt in Chile was not ready in time, so instead they met at a Bitcoin bar in the nearby town of Valdivia. Meanwhile, a barbeque was held at Tim Tayshun’s house in Orange County, and various activities took place at two locations in Vancouver. As usual, CoinFest 2017 included a variety of geographically decentralized activities designed to unite the simultaneous events around the world. Foremost among them was the International Hangout, which beams virtual presentations to projector screens at multiple locations simultaneously. the longest segment—connecting Vancouver and Manchester—was once again hosted by Blocktalk. Some new radio programs joined the fun, as well, such as New Africa Radio and the Crypto Show. This allowed CoinFest organizers in Vancouver and Chile to join Nigeria and Sierra Lone in reaching a huge radio audience. Decentralized video games and Tim Tayshun’s Wheel of Bitcoin made an appearance, as well. CoinFest UK stole the show this year with a massive event at MadLab, a center of innovation in Manchester that does, of course, support crypto. Organized by Adam Rizvi, founder of Crypto Bates Group, it was widely anticipated as the first CoinFest on British soil, and amassed hundreds of pre-registrations. Guests came from all over the world! All manner of talks and presentations were held for both cryptocurrency newbies and aficionados. The show floor was even more popular, with booths from all the sponsors and cool demonstrations like Bitcoin nodes, debit cards, games and other exciting new innovations from the altcoin sector. There was also all manner of accessories and memorabilia available, as well as prizes and a raffle into which each attendee was automatically entered. The Netherlands was a hotbed of activity during CoinFest 2016, especially in the city of Amsterdam. It started on April 5 at the Old Amsterdam Stock Exchange, organized by Bitcoinference. April 6 featured an event by Bitcoin Wednesday, with more presentations at Lab111—one of the major highlights was Andreas Antonopoulos, whom they hosted for the International Hangout. CoinFest also returned to Arnhem, the Bitcoin City. Boasting over 100 Bitcoin merchants including a Burger King, it is arguably the most Bitcoin-friendly city in the world, and celebrates all things crypto. The 2016 gathering was held at the Brownies & downieS, one of many Bitcoin venues in the district. Nestled in a scenic valley in the French-speaking part of the country, the small town of St. Imier is home to La Décentrale, a community space fostering permaculture, cooperative models, decentralization and other innovative projects. They opened their doors to CoinFest celebrants for all 6 days, with people coming, going, and often staying the night. They took part in all of the decentralized activities and streamed a presentation about FairCoin. CoinFest spread to Niagara for the first time, home to one of the world’s greatest natural wonders, where workshops were held to educate the public on practical Bitcoin use. CoinFest was also held again in Vancouver, as is tradition, but hosted entirely at the community space at Richards and Pender. We used it as a headquarters for global CoinFest operations, allowing anyone to get an inside view of the decentralized convention in action. 2016 was the year CoinFest finally reached American soil, which it did in full force. The largest event was in Washington DC at the General Assembly. It included free drinks and presentations from notable speakers like Elizabeth McCauley of Coinsecure, with topics including Bitcoin’s benefits for developing countries and the registration of land titles and other property on the blockchain. There was also a barbeque and party in Orange County with free drinks and prizes, courtesy of Airbitz and Tim Tayshun, and smaller events across the country. CoinFest Midwest covered Kansas City and Omaha, eMunie held a presentation at a library in Washington state, and the Synereo team put some virtual hangouts together in Tampa Bay, Florida. The team behind Fort Galt has long been interested in participating in CoinFest, but construction of their entrepreneurial community has yet to be completed. They’ve been working hard to spread Bitcoin adoption in the nearby city of Valdivia, however, and will soon have beer for sale for BTC, so they decided to celebrate at a local Bitcoin pub. Repeating his success from 2015, Afrikanus Kofi Akosah Adusei of the AYPC held another gathering at the Queen City Restaurant in Kumasi. A generous sponsor provided free drinks to everybody, and everybody enjoyed the free prizes from the global activities. About 70% of attendees received their very first Bitcoin wallet! For years, people had been asking when CoinFest would arrive in the East, and finally their calls were answered. The Seoul Bitcoin Meet Up group was the first to throw their hats in the ring, and met to participate in the decentralized activities. Soon, BTCC—a Chinese company that provides exchange services, a pool, wallets and more—decided to organize an event at Shanghai Center, where they had a presentation, prizes and coffee for Bitcoin. Moving to the southwest, CoinFest also broke new ground in India thanks to the welcome support of Coinsecure, and Indian Bitcoin exchange and wallet provider. Alongside the team behind Airbitz, they held discussions to educate the public about Bitcoin’s use and benefits at the Center for Internet and Society in Bangalore, where mainstream knowledge is still very limited. CoinFest 2016 included a variety of geographically decentralized activities designed to unite the simultaneous events around the world, foremost among them being the International Hangout. The above video shows a few of many virtual presentations that were beamed to audiences around the world via projector screen, as well as anyone who wanted to watch at home via YouTube. They ran on multiple days and were broadcast on Twitch via the Synereo team. Tim Tayshun also brought back the Wheel of Bitcoin, with prizes like a BitNation-brand hardware wallet, 100 trillion Zimbabwean dollars, and of course some mBTC. Cryptocurrency-integrated video games such as Grabbit, Huntercoin and TurboCharged held online tournaments with coin prizes, and Airbitz gave away wallets pre-loaded with a few USD worth of bitcoins each! CoinFest Africa was the most challenging to pull off by far: the Bitcoin ATM we shipped to Botswana was delayed, which combined with funding problems to force the postponement of activities. This turned out to be a blessing in disguise, however, as new countries had time to join the fun. Our Skyhook Bitcoin ATM from the Taurus Bitcoin Exchange arrived safely in Gaborone, bringing crypto to the people, but unfortunately not in time for CoinFest. Regardless, dozens of people came out for the event to learn what the fuss is about, and CoinFest Botswana received generous donations from Tim Tayshun and Sinclair. Ghana was a hotspot of activity during CoinFest, occuring in two locations. Dream Bitcoin Foundation managed to raise a bunch of BTC to promote decentralization, and took a lead role in promotions. Africa Youth Peace Call also held a professional workshop on Bitcoin geared towards entrepreneurs. CoinFest Tanzania formed at the very last minute, but managed to be a huge success thanks to sponsors like BitSafari and AutoNet. They broke Bitcoin down in both English and Swahili, and had giveaways including a Bitcoin Wheel of Fortune. Major thanks to Bitcoin Tanzania for their efforts. When CoinFest expanded out of Canada, it skipped the United States and kept going south. South America was the second continent to join the CoinFest movement, and it took things to another level. With sponsors like BitPay, Bitcoin Argentina at the Buenos Aires Bitcoin Center was able to spread the word far and wide. They had a conference geared towards new adopters, and workshops and discussions alongside. Then they hit the streets with Mr. Bitcoin himself, followed by a barbeque with the Rise and Rise of Bitcoin projected onto the building nearby. The Bitcoin Foundation of Colombia brought some new innovations to CoinFest. Like others, they had Bitcoin merchandise, food drinks available for Bitcoin, and a Bitcoin ATM. What set them apart, however, was their development of CoinFest’s blockchain-based attendee cards, based on Bitnation technology. Fortaleza was the first city to bring CoinFest outside of Canada, and thereby the first in Latin America. Although not all of their original projected goals were met, they had the backing of the Cryptor Foundation. Helio Silva pulled through to educate the people of Brazil on cryptocurrency on its most celebrated weekend of the year! CoinFest first landed in Europe via Rome, but plans there fell through. Nontheless, Europe continued on, particularly in its north and east. They demonstrated the true Spirit of CoinFest. The Bitcoin community is thriving in Finland, but CoinFest still had some obstacles. Andre Juselius pulled through despite many problems including hospitalization with a heart-related episode, and they had an awesome conference. CoinFest Estonia was one of the last nodes to join CoinFest 2015. They managed to put together some great presentations in no time, having their own Bitcoin venue available. It wound up hosting one of the most popular events—our thanks to the organizers! The Bitcoin Foundation of Ukraine brought CoinFest there, as well; Maksym Krupyshev organized a Satoshi Square in Kiev, the first such event to occur at CoinFest. CoinFest also spread to Arnhem Bitcoinstad, also known as “Bitcoincity.” They had an entire neighborhood of Bitcoin venues, which is the perfect setting to celebrate CoinFest in true decentralized fashion. 2015 will be remembered as the year CoinFest left Canada. Vancouver was dethroned as the center of activity, giving way to a more decentralized future. Canada still put on a good show, however, with at least 3 cities participating. CoinFest Vancouver was an ambitious project, involving multiple venues across the city and culminating in a conference at the Sandman Hotel. All of our hosts accepted Bitcoin, and we proudly promoted Bitcoin adoption via creative methods at each event. There were fewer enthusiasts in attendance this year, but Bitcoin Poker and the hangouts at Decentral Vancouver were popular. Edmonton was lost, but Winnipeg and Toronto carried on with celebrations at Bitcoin venues of their own. Directors and members of the Bitcoin Alliance of Canada brought CoinFest to to Santa Lucia Pizza in Winnipeg and the Decentral headquarters in Toronto. Anne Connelly presented on Bitcoin charity, in partnership with her non-profit Dignitas International. Our biggest sponsor for CoinFest 2015 was the Taurus Exchange, a cryptocurrency exchange based out of Vancouver. They donated the Skyhook BTM we sent to Botswana. Thanks, Yuri Yerofeyev! Organized by Liza J. Lee of Lead Gen Communications, the trade show had a podcast tent, Bitcoin artists and buskers, a Bitcoin auction of various artwork, information booths, and more! Here CoinTrader unveiled the first Dogecoin ATM in the city, and showed off their existing Robocoin BTC ATM, which was the world’s first. We also had Bryan Hellard of Newnote Miners demonstrate Bitcoin mining equipment, and Crypto Think Tank came to demonstrate Scrypt miners, as well! There was a lot going on. Now a director of the Bitcoin Alliance of Canada and returning for CoinFest 2015, Josh Nekrep put Winnipeg on the map by helping orchestrate the launch of the city’s first Bitcoin at Canada’s first pizza place to accept Bitcoin. They also had a presentation and discussion. Check out his website. Major thanks to Bitcoiniacs—now CoinTrader—whose generous contributions made CoinFest 2014 possible. They brought the world’s first Bitcoin ATM to Vancouver, and now run an international Bitcoin exchange as well as brokerages around the world. The Bitcoin Co-op, a non-profit association dedication to spreading cryptocurrency adoption and decentralization in general. Newnote Financial, an umbrella corporation providing a wide variety of cryptocurrency-related services. CryptoThinkTank, a cryptocurrency mining business. CryptØMiners, which is in the cryptocurrency consulting and hardware business. The Sovereign Exchange, where you can trade Bitcoin and Litecoin directly for digital silver that can be redeemed at any time.